Climb by good motorable road along the gondola Charamillon. The one moves away from the coast 1850 m. The only vegetation is a short grass because this land is snow covered a major part of the year. Upon arrival of the chairlift (2186 m), take on the left the vehicle track towards the Col de Balme (2191 m). Its mark the Franco-Swiss border. Since the Tour, starting 2:30 mounted. Climb the ridge that leads to the Croix de Fer (2343 m). View the canton of Valais, the Forclaz pass and the Rhone Valley. 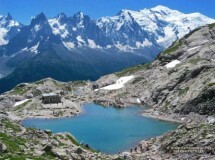 After the picnic, we must return to the Col de Balme and the intermediate station Charamillon and down through the pasture of Balme and its herds of cows Herens. A gradient of 900-1000 m and a distance of 12 km. Walking time: about 5 hours. Meeting point at 07:30 at the French side of the Moellesulaz customs, in front of the Librairie de France.